Ways To Start Labuan Real Estate Investment Fund Business- It is easy! Asia and ASEAN countries are known for their stability and growing economy. Stable currency and governments and resource-rich countries like Singapore, Thailand, Malaysia, and Indonesia with a combined population of more than 300mil people, are natural attractions to investors. Rising income from these vibrant economies is receiving a lot of attention from the property investors because of the plentiful low cost, good quality properties in a lush greenery of natural beauty. Varying and high potential growth in profit in real estate investment derive from ready block purchase, land acquisitions and project developments are drawing investors. More fund companies are keen to have their presence in Labuan also due to proximity to the opportunities in the real estate markets in Asia including Malaysia. If you have a business idea in the real estate market that you want to tap into Labuan Real Estate Investment Fund is worth considering. Labuan International Financial Centre is listed on the OECD’s whitelist. Most business people are not aware that Labuan Companies are recognized for listing in the Hong Kong Stock Exchange. This recognition is attesting to the reputation of Labuan companies and Labuan jurisdiction as the place where clean and genuine businesses are thriving. To date, there are more than 50 banks, tens of brokerages, hundreds of fund management companies who have chosen Labuan over many other offshore jurisdictions. Real Estate Investment fund can be easily set up with a simple Labuan Company or Limited Partnership or Limited Liability Partnership. 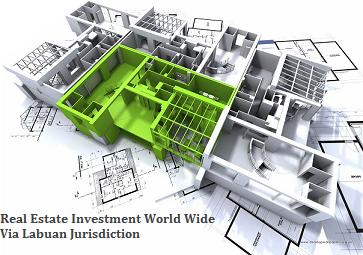 Each of the entity to invest for real estate investment vehicle has its own merits. Most importantly is to find one suitable entity to match your business objectives on how funds are raised for the investment. Contact us today to find out more about how to get started with your Real Estate Investment Fund Business! Email us the Enquiry Form today! We “simplify the complexities” of your investment in Labuan. If you are keen to meet us, call us at +603-2783 9191 for an appointment at our Kuala Lumpur Office.